A welcome poster or the Republican National Convention in New Orleans, LA on August 15-18. 1988. The convention nominated Vice President George H. W. Bush for President. Bush was nominated without opposition during the roll call vote, but with rumblings of opposition to the Quayle nomination, it was decided to have it ratified by voice vote, something that the Republicans had never done before. 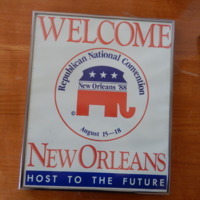 “Welcome Sign for the Republican National Convention in New Orleans, August 15-18, 1988,” UIS History Harvest, accessed April 22, 2019, http://uishistharv1.uis.edu/items/show/189.